You've never had cheesy cauliflower soup like this! Its powerhouse partners in deliciousness are kale, quinoa and cut-up pieces of bacon. Brown bacon in the bottom of a heavy stock pot. When bacon is crisp, don’t bother draining. Add the carrots and onions to the stock pot and continue cooking 2-3 minutes. You may note a few bits of the bacon or veggies clinging to the bottom of the pot. These will come loose when the chicken stock is added and deglazes the pan. Add the chicken stock and bring the pot to a boil, stirring to loosen anything that may be sticking at the bottom of the pan. Once everything is moving freely, add the cauliflower and kale and reduce heat to a simmer. Simmer for 15 minutes and then add the quinoa, cream cheese, cheddar and cream. Stir until cheeses have melted and all ingredients are completely incorporated. Remove from heat. 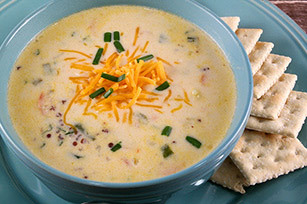 Serve with optional garnishes of additional shredded cheese and sliced green onions.